Window mounted air conditioning units are widely used in many scenarios to help cool a space. There are many available from vary small units to quality quiet models all built to fit the situation. Most window units range from around 6,000-25,000 BTU’s which is the cooling capacity a unit has. Larger units range from 10,000-25,000 BTU’s or more. One thing to keep in mind when looking for a large window AC units is most 115 volts systems max out around 12,000 BTU. 220-240 volts is usually only used by clothes driers, electric stoves, and electric water heaters. 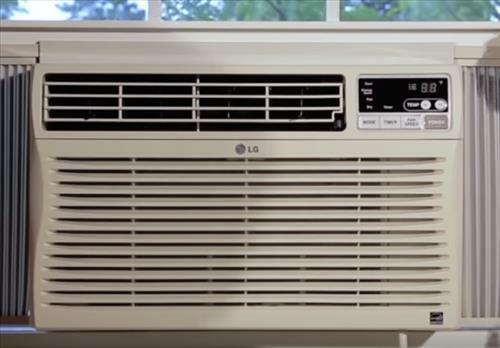 Below is out picks for the best large window air conditioning units for 2019. The model WAC10002WCO is a 10,000 BTU unit and works from a standard 115 volt outlet. It is a good standard unit with 3 speeds, remote control and many other features. There are larger units but most will run from 230 volts. LG is another well known air conditioner manufacture with many units available. They have sizes ranging from 6,000-18,000 BTU. The new LG units also come with or without WiFi which is a nice feature. The LG LW1516ER 15,000 BTU unit is about as big as they come for 110-115 volts standard home outlet. Frigidaire is a top air conditioner manufacture that has many units available in all shapes and sizes. The FFRE2533U2 model is a big unit at 25,000 BTU which is rated to cool a space up-to 1,600 square foot. It will need a 230 volt outlet to work and will not run from a standard 115 volt plug. Friedrich Chill has many window A/C unit ranging from 5200-24,000 BTU. The 24,000 BTU unit is rated to cool a space up-to 1400 Square Feet. It is also well built and one of the more quieter window units available. This Black and Decker model is not the typical window unit and built for portability. It works by pumping heat out a 5 inch hose which can be easily place in a window. It also can heat in the winter which is a bonus when it gets cold. With 14,000 BTUs of cooling power it is one of the higher rated A/C units that will run from a 110-120 volt outlet. The bottom has wheels to roll it around for portability such as storing away until needed. This makes it ideal in many scenarios such as an apartment or any rental when a unit is not permanent. If you have a large space to cool during the summer a large window air conditioner can be a good option. Most 115 volt units will have a max BTU rating of 10,000-12,000 BTU while larger units will run from 230 volts. If there is no 230 volt outlet one can be run by electrician but will add to the cost. Also be sure to measure the window to be sure a unit will fit. Beside the classic window air conditioner there is also portable units that work great. Portable units pump heat out a large hose usually 5-7 inches wide. This can makes them ideal in many scenario and easily store away during cooler temperatures. Do you have found a good unit? Let us know in the comment below.